We’re featuring Eric Rohmann today, which is quite a thrill. I’m a huge fan of his books and the beautiful art work he creates. If you’re not familiar with his books (well, you know you know the Caldecott winner, My Friend Rabbit), here’s one place you can begin, a link that includes another link to a bibliography. 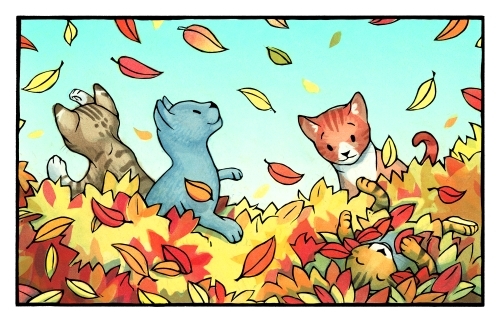 The above illustration is from his new picture book, A Kitten Tale (released this month by Knopf Books), which I raved about maniacally in this post (hey, 7-Imp is — mostly and for all intents and purposes — a fan site, and Eisha and I are geeky Rohmann fans. And he doesn’t disappoint with this title, which just adds to his already impressive track record). 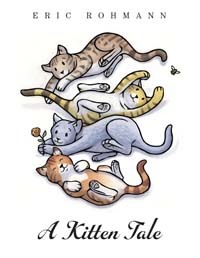 Summary if you don’t want to read the afore-linked review I wrote: A Kitten Tale is a wonder. It’s a splendid tale for the very young. Here are three more images (I hope the colors on these illustrations are right; they look slightly different than the ones in the ARC I have, but it could be an artifact of my computer). And p.s. these images are just for Little Willow. We might just maybe possibly perhaps have an interview with Rohmann soon, too, which we think would be exciting, needless to say. Cross fingers. Thanks to Random House and Rohmann for the images we’re sharing today. I’ll leave the kicks to Eisha this week, and I hope hers was kick-y, indeed. We know, as of Friday, that she has a neighbor who loans her poetry, and I am jealous of her neighbor. Yes, I’d love her to live one floor below to share poetry and coffee with daily (and, boy howdy, would my almost-four-year-old be staggeringly happy to see Eisha more than once or twice a year). And I hope everyone else had a good week and stops by to tell us why. 1* The husband and I have been watching the DVDs we gave each other for Christmas: Firefly (which I gave him) and the 2nd season of My Name is Earl (which he gave me). 2* I’m continuing to enjoy temping at Cornell. They keep me busy, the people I’m working with are kind and funny, and the meticulous filing and organizing and labeling appeals to my librarian sensibilities. 3* I got a preparatory packet from a library in regards to a job interview I have coming up. For part of the day-long interview, I have to give a presentation on what kind of programs I envision doing there. While the very thought of doing this FREAKS ME THE HELL OUT… I’m also excited, and hopefully even a bit inspired. 4* I had a nasty cold all week, but it’s practically gone. I’ve gone two whole days now without taking anything stronger than a lozenge, and there’s hardly any coughing, aching or oozing left in me. 5* I’ve been reveling in being able to read stuff that has nothing to do with the Cybils. 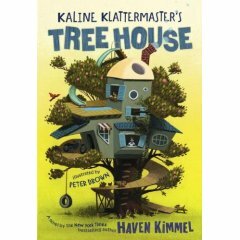 I finally read My Swordhand is Singing by Marcus Sedgwick and Kaline Klattermaster’s Tree House by Haven Kimmel. And I reread Neil Gaiman’s Anansi Boys. Bliss. 6* My sister just got a new laptop (a red Sony Vaio that she has named Ruby), and given my current computer woes, she’s decided to mail me her old one to use until I figure out what to do about my poor Roxy. She’s way too good to me. 7* Jules, sweet Jules, awesome and amazing and capable and generous Jules, continues to keep this blog going while I grab occasional stolen moments on my husband’s computer and await the coming of the borrowed laptop. Thanks, J. Your hard work and dedication do NOT go unnoticed. That’s all I got. How about you, Dear Readers? Anything cool happen to you this week? Please share! I love My Friend Rabbit as well as Clara and Asha. 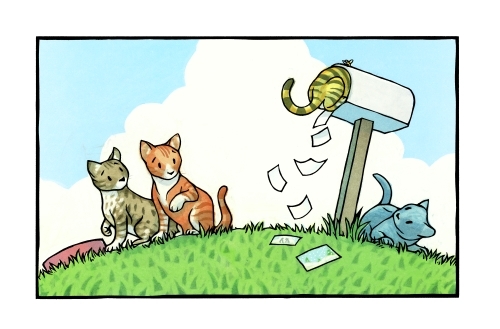 I look forward to reading A Kitten Tale. Eisha: I’m happy to hear that your job is continuing to treat you well. Break a leg at the interview. Breathe. Don’t freak out. YOU CAN DO THIS. Now rest up so you can give it your all. Have a good night’s sleep and feel better! The pictures of the kittens. I walked four miles today. I brought groceries. I spent $4.65 and saved $25.60! I saw a casting call for a show being directed by someone I worked with last year. Even though I didn’t fit any of the parts on the breakdown, I emailed the director and asked if I suited any role. He told me to come by the auditions tomorrow (Sunday). Someone called and asked me to audition for something on Tuesday. I knew I hadn’t submitted for this project – I hadn’t even heard of it! It turns out that they were behind a show I had submitted myself for sometime last year and never heard back from then. So… we’ll see. I wrote four original pieces (short stories and/or non-fiction) in the past week. I dodged a bullet earlier this week because I trust my instincts and I do my research. 1. I received a tremendous outpouring of help and support from the Kidlitosphere Yahoo Group this week. This led to the creation of what I think is a pretty cool article about helping kids learn to love reading. The people at PBS seem pleased, too, which is excellent. And the discussion over at PBS continues to be SO much fun. The Kidlitosphere rocks, that’s all I have to say. 2. The Cybils short lists are all in, and, as a judge for YA Fiction, and an organizer for MG/YA nonfiction, I’m very pleased with the selections. 3. This is maybe a bit older than a week, but I don’t think I shared it before: Vivian from HipWriterMama is going to be a new postergirl for readergirlz, and Mitali Perkins is going to be a new readergirlz diva. So cool to have this Massachusetts-based branch of the organization developing, with such great representatives. 4. Speaking of Massachusetts, how about those Patriots? 5. Mheir brought me home chocolate mousse cheesecake from Cheesecake Factory the other day, for no occasion whatsoever. I think he is a keeper. And really, this is quite enough for anyone for one week. Happy Sunday! Little Willow, what great kicks. Congrats on the call backs and dodging that cryptic bullet (but cryptic is okay; you don’t have to tell). Glad you like those kitties. Jen, but did you see Eisha’s alt tag on the picture of the Firefly guy? I think perhaps she thinks he’s cuter than those kittens, too. I believe she used the word “yummery.” It made me laugh anyway. I did not know that about HipWriterMama and Mitali, ’cause I’m really behind on blog-reading this week. Congrats to them! AND YOUR ARTICLE, Jen, jump back! It’s fabulous, your post was fabulous, and most fabulous of all was the response and support you got from the kidlitosphere. I’m still gonna talk it up in my next post-for-parents (the new feature I’m trying out) — whenever I get to it, that is. Here’s a kick — I saw “I Am Legend” yesterday. There’s nothing like a post-apocalyptic science fiction horror film to celebrate your wedding anniversary. Very good, and Will Smith’s acting moved me to tears, people. 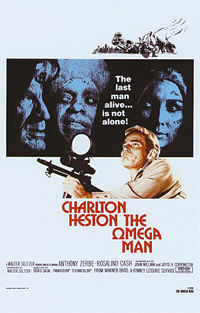 Much better than “The Omega Man,” which we actually own on DVD. Heh. Eisha, I didn’t know you were an Earl fan. I thought that was my secret laugh fest. Did you see the one where Joy writes an imaginary kids’ book? I also adore the Cops show spoofs. What’s kicky? I’m not in a list mood, for some reason. I’m just glad to be alive and loved today. I think that’s from finishing A Thousand Splendid Suns late last night. But I will say that I’ve totally enjoyed all the fun comments at my blog this week, both for Poetry Friday and for my earlier posts about boy-centered bookstore design. Oh! and if you haven’t already, go watch the Office/Heroes spoof that Adrienne dug up on YouTube. It’s hilarious. 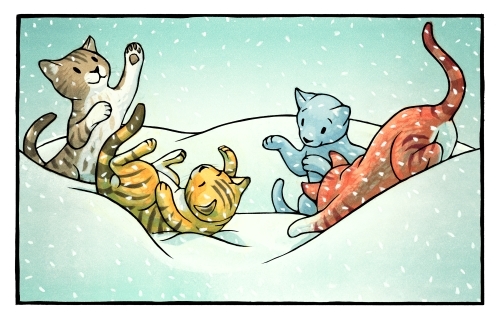 LOVE LOVE LOVE those kittens! Are ALL of them for LW, or may I have the first one, of them looking out the window at the snow? Happy Anniversary, Jules (missing your kicks today). Good luck on the upcoming job presentation thing, Eisha, and I really hope there’s help for Roxy soon. Good luck to LW too on the auditions and call backs. 1. Jen Robinson’s post about getting kids to read. So comprehensive and off the scale of awesome. Love her PBS gig, too! 2. My husband gave me some beautiful white roses just because. 3. Made some fish chowder for the first time and loved it! 4. Received a copy of Jackie Urbanovic’s DUCK SOUP, which was released on January 8th. It’s a SCREAM, and I’m crazy excited because she’s stopping by my blog for an interview soon in honor of soup month! 5. PBS’ Masterpiece Theatre is featuring adaptations of all Jane Austen’s novels, Sunday nights at 9 p.m. for the next several weeks! Tonight the series begins with PERSUASION. 6. Saw “The Wedding Date” for the first time, and loved Dermot Mulroney. I loved him a lot in “My Best Friend’s Wedding,” too, so I think maybe I was married to him in a former life. Yes, he really does it for me, somehow. 7. Bluebirds visited our back yard! Those images made me squeal like the Rat Man in The Wall and the Wing: KITTY! 4. Found my poem in Laura Salas’s Write Your Own Poetry book. 6. Read Sara Holmes’s poem about the flower in Tibet, which blew me away. 7. Found a new song to play over & over, which makes me happy. Sara, yes, your flower poem was great. It was a big ray of sunlight. I’m glad you liked A Thousand Splendid Suns. I did, too, and I believe I rambled about it in a kicks post once. I thought there were scenes from that book that were unforgettable, still seared in my memory. And, Sara, I went and watched the video at Adrienne’s blog. Very funny. Jama, that’s great about the Urbanovic interview — and white roses. Seven kinds of awesome right there. And does Kelly F. know about these Masterpiece Theatre Jane Austen adaptations? 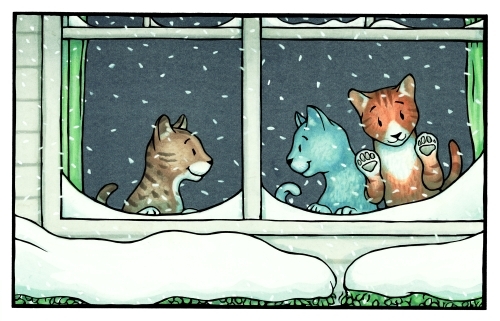 Oh and yes, the kitties-in-the-window illustration can be just for you. Kelly, I’ll have to go read about the swag. And, hey, what’s your song? Back to Piper’s Pony Picnic Party. Oh those kittens! I want to hold them all. They are precious! Jules, happy anniversary, hope dinner came with the movie. Eisha, break a leg is right on the interview. Think of all the great things you and done and wnat to do if you are in that position. Seems like husbands are doing random acts of sweetness this week, mine had dinner ready for me a couple nights this week (1st week back since the break). 1.The response regarding my photo. I don’t know if it will win but I feel a winner already with everyone’s kind remarks. 2.Not really a kick but I returned to the doctor on Thursday and was put on an antibiotic. That made me nauseous, when I went to the acupuncturist, she place needles in my stomach and the nausea went away. Truly most amazing session in 10 years. 3.Saw Atonement yeasterday with Chuck. Haven’t read the book and will not. Loved the movie. 4. Was able to get an author contact from Jules and Eisha for what I hope will be an upcoming student interview with the author. 5. My granddaughters coming for the weekly public library gig at my school. They seemed older since Christmas. 6. Scored 8 red velveteen placemats for $1.24 a piece. I love sales like that , 75 % off. Jules, I found the post you did about A Thousand Splendid Suns. Word. And—psychic twin–I knew, just knew, what sentence you were going to pull out! That line killed me too, and has even more power because the rest of the book is so unlike that. And he has such storytelling chops that I felt like I lived in that house, you know? Jone, congrats on the scored author contact; I hope it works out and would love to read that student interview. Sorry about your nausea, but I’m glad the acupuncturist made it go away. And go, Chuck, go with that dinner. Sara, to be your psychic brain twin would be a compliment to me. Yes, what a great line, huh? I’ll always remember a friend of mine recommending The Kite Runner to me years ago, and what sold me on picking it up to read it was when she said, “it changed the way I see the news now.” This book is similar in that way, too, don’t you think? Glad you loved it. I’ll read anything he writes. P.S. Eisha got to hear him speak once! Hello Everyone! I just love, love, love Eric Rohmann, but let’s put the confession right out front and say that I am a dog lover! I hope he turns his talents to my favorite pet one day (sorry Little Willow!). Not many kicks in my life these days, as I am one week away from hosting a team that will review our education programs. I am spending every waking minute at work. However, I can come up with one or two things that made the week a tad bit better. 1. I won a copy of Shante Keys and the New Year’s Peas!! from Jama Rattigan. I am one lucky duck (as my son told me). 2. Sara’s poem. It’s more beautiful than my picture. 3. I bought myself a new notebook today. It’s awesome. Lefthanders unite and snap up a copy of the Lefty Noetbook! OOPS! That should be Notebook! Jules, I did miss that alt tag. Too funny! But clearly apt. And thanks for your support on my article. The Kidlitosphere is the greatest place in the world, that’s all I can say. You know, if something virtual can be a place, at least. Glad you’re having a good weekend. “I Am Legend” sounds right up my alley. Sara, I loved the comments on your posts, too. I’m featuring the stuff about boy-centered bookstore design in my Sunday Visits post this week. And Jama, I’m honored to make your kicks list. What a nice way to start the day! Thanks for the reminder about the Jane Austen thing, too. I have to get my Tivo set up for some of those. In fact, I’m going to copy you and retrospectively make that my 6th kick. Oh, and Jone, I want to see Atonement, too, and also haven’t read the book. The previews make it look fabulous. Can I also mention that last Sunday I bought myself thePoet’s Notebook! I am a glutten for notebooks! I am left-handed. It is on my list! How cool. I’m left-handed, too. Thanks for the suggestions, Tricia! Oh, and I need to add one more kick. I got an email today (in response to a review that I wrote) from Sam Youd. Sam writes as John Christopher, whose books I LOVED as a kid. The 12-year-old kid inside of me is just thrilled to think of receiving a note from an author that I was admired this much. This Internet thing is amazing. Did you ever think, when you were a kid, that it would be a normal thing to hear from authors of books that you love? To have them contacting you? I love it! This one is extra-special, because I’ve been a fan for so long … like close on 30 years. And ok, I’ll stop hogging the discussion now. Wow, Jone, did you ever think you’d write “she place needles in my stomach” on a list of good things ? 🙂 Glad it helped, though! Good luck with the interview Eisha! I always forget bluebirds are real, Jama. They always seem so Mary Poppins! I didn’t comment on your encouraging kids to read post, Jen, but thought it was fantastic. I’m a bit disorganised today so only have five things on my list! Those kittens are sure cute, though, and very cheering. 1. Yesterday was a lovely sunny day. We went and joined in a tree-planting at a local reserve, which was fun even if the little deciduous saplings mostly looked like sticks. 3. I’ve been arranging for time off in the next year – it seems so strange, but also nice, to have so much leave to use! 5. Although our first attempt at roast duck wasn’t all that it could have been, there were plenty of roast veggies leftover for pizza topping tonight. LW – break legs on both those auditions. And you must write a book about your bargain shopping techniques. Jen, you have very good taste. 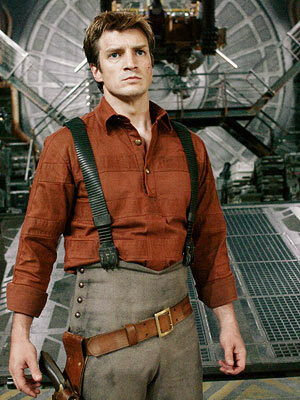 Nathan Fillion is hotness incarnate. And well done on the PBS discussion. And NO, I had no idea we’d ever be conversing online with authors and illustrators I’ve admired since forever. It’s truly awesome. Sara – no way, you too? I guess it figures that a fellow Drive-By Truckers fan would also get Earl. No, I haven’t seen the one where Joy writes a book, but the Cops episode is HILARIOUS. Jama – Soup Month? Where do I sign up? I LOVE soup! And bluebirds? How very cool. Kelly, congrats about having your poem published in Laura Salas’s book. And yeah, what’s your song? Jone, thanks for the good wishes. Your acupuncture story skeeved me right up out of my chair, but I’m glad it works for you. Good luck with the photo. Tricia, what a find! A notebook just for you – and all the other secret lefties that are apparently all over the kidlitosphere. I hope work gets less crazy for you soon. Emmaco, roast veggie pizza sounds delicious – way to “make lemonade out of lemons,” as they say. Enjoy all that vacation time. Thanks, Jen! I walked almost as far this afternoon, and I’m going to go for another walk (library!) in a few minutes. Jules and Jama: Thanks! I just got back from one audition and the other on Tuesday. Interesting prospects. More to Jules: Let’s just say I refuse to do anything I don’t want to do. This is why I urge people to trust their gut. Eisha: We were posting at the same time earlier and I missed your comments. Thank you. YAY for saving money! I can’t believe I missed the Kicks when you guys were featuring Eric Rohmann and kitties. And look at how much fun you had! I was cleaning the house getting ready for my trip. Not nearly so fun. Eisha, Firefly is the best. Seriously. I just got an FNG of this picture book at the Random House preview today. I don’t normally do picture books, since I am on the YA prowl. But I love cat books. Late as usual. This morning, I woke up and thought, “There’s no way I should see light in the sky already.” Sure enough, the alarm had been set but not turned on. Add me taking care of a coughing girlie in the middle of the night– of course we overslept. However, we were able to get into gear and out the door in 20 minutes. Hurrah! I truly admire Rohman’s book covers for His Dark Materials, especially The Amber Spyglass. Of all the things to illustrate for the cover, the crux of the story, the journey through the land of Death, was depicted. Brilliant. 1) Two birthday party gigs that went well. The second gig was a mite unpredictable, but still fun. The hostess sent me home with cake and balloons for my daughter, who was unable to go to a birthday party of her friend’s because my husband was sick. 2) Seven year anniversary! Yes, Bede was sick for all of it, but it was a good thing we celebrated two days early with friends at a favorite restaurant. 3) My guitar teacher tabbed “Sister Rosetta Goes Before Us” for me. It’ll be a stretch, but it’s something I look forward to working on. That said, I’ve not been able to start working on it yet. 4) My anniversary present was an iPod classic with 160 GB. I don’t have my entire music collecition on it, but what I considered to be a “lot” of music barely takes up any room at all. I have too much power! For the first and only time, I’ve got the latest and newest technology in the family. 5) My husband has started making pie. 6) I really love how intent my daughter is with her drawing. She fills up sketchpads. I enjoy watching her face as she draws. 7) I bought huckleberry bushes to replace the honeysuckle I dug up and replanted by the West gate. I have hopes that the honeysuckle will revive in actual sunlight, and that the huckleberries will enjoy the dappled sunlight by the East side of the house. I have more plans for landscaping, and that’s always a good thing.